Our blankets are made with a silky soft to the touch proprietary polyester blend to create the incredibly warm yet washable blanket material. Simply put, Nubay Plush™s is the wow factor in our stadium blankets. You can feel the difference the moment you touch it! Blankets are available in two popular sizes large (48"x70") and extra large (60"x80"). Our talented graphics team will use your organizations colors, logos, and art elements to create multiple unique personalized blanket designs. 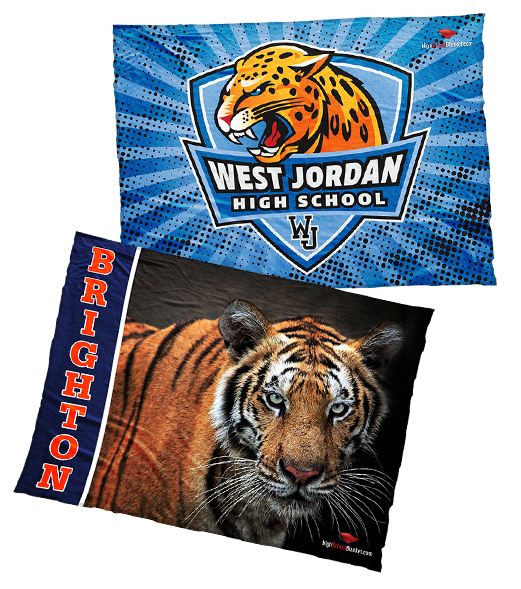 Our classic Nubay Plush fabric boldly displays your school's mascot or custom design on a thick, feather-soft canvas. These 60" x 80" custom blankets are perfect for football games, cozy nights at home, or to wrap up in around the campfire. Our Nubay Lite fabric provides incredible lightweight comfort in brilliant color and detail. While also displaying a 60" x 80" footprint, this custom blanket features a sleek profile that is comfy, slim, and warm.